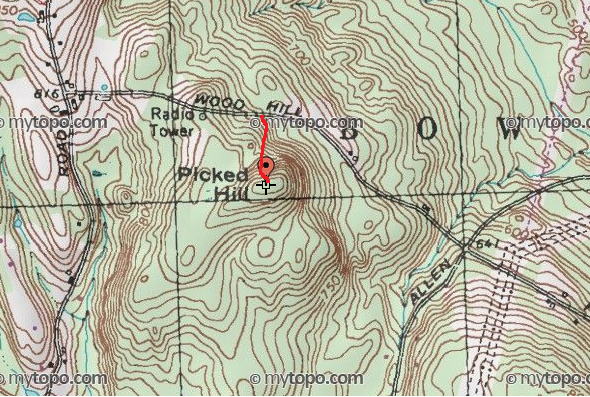 HockeyPucks hiking and highpointing: Picked Hill - 915 Ft.
From route 3A turn onto Pine St. After 0.5 miles Pine St becomes Bow Bog road. Follow it for another 2.1 miles to Allen Road on your left. After 1.3 miles turn right onto Woodhill Hooksett road and follow it for 0.5 miles. Park on the shoulder of the road. DESCRIPTION: From parking, cross Woodhill Hooksett road and enter the woods. You almost instantly reach the former clear cut which is now filled with ferns, short tree growth and waist tall thorny raspberry bushes. The growth is thick and pace is slow going for approximately 300 feet until the raspberry thorns disperse and terrain becomes thinner with mostly tall grasses. The incline becomes steep over rocky terrain to the summit proper then it's a 2 minute walk through blueberry bushes to the highest point. the highest point appeared to be a small open rocky knoll about 4 ft. in diameter. There are no markings at the summit. Peaked Hill offers spectacular panoramic views of the surrounding area. Kearsarge can be seen to the north. Carefully descend the way you came. In my research I was unable to find a lot of information about Picked hill other than it's the highest point in the town of Bow, NH. The 50th most prominent peak in Merrimack County and 625th most prominent peak in New Hampshire. Picked Hill is deceiving in more than one facet due to the appearance of a short 0.15 mile one way distance however the terrain is over very rough and thick bushes making what would normally be a 5 minute hike much longer. The second deception is the very open and bare hill shown on Google Earth is currently extremely overgrown with thick ferns mixed with blueberry and sharp raspberry bushes. Picked Hill should be renamed Pricked Hill.